Like a bag of trick-or-treat candy, October holds a multicolor variety of sweet targets: pale blue galaxies, red and teal planetaries, and deep red nebulae. 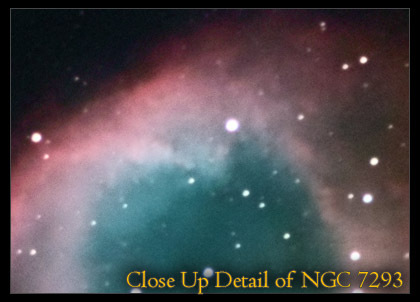 Let's start with the best object this month: NGC 7293, better known as the Helix Nebula, and easily one of the top twenty astrophotographic targets in the sky. This giant planetary nebula is easy to capture with a rich-field Newtonian, though almost any class of telescope will yield a great image. See if you can resolve the delicate, almost cometary, knots of nebulosity in the inner ring. 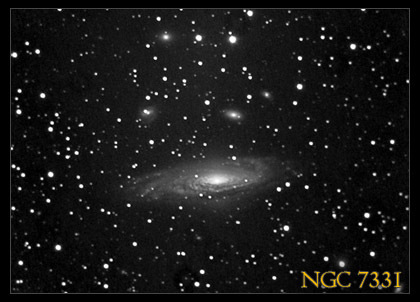 Because I have a weakness for galaxies, my favorite target this month is NGC 7331. This spiral galaxy shows tightly coiled arms and a bright nucleus, much like M63. It is also appears to be accompanied by three smaller galaxies (though they are in fact much further away), and the four objects together make a nice composition. Coincidentally, not far away from NGC 7331 is the famous compact galaxy group known as Stephan's Quintet. The galaxies in this group appear distorted because they are gravitationally interacting with one another. Eventually (in millions of years) they will all merge together into a single (and less visually interesting) elliptical galaxy. Until then, you can best capture this group with a large aperture telescope. Finally, for the nebula lovers among us, October has two beautiful emission nebulae. The first is the Bubble Nebula (NGC 7635), which was blown by the stellar wind of massive hot star. Unlike some of the giant nebulae of September, the Bubble Nebula fits comfortably in the field of view of an average camera on a rich-field Newtonian. Fainter and larger, but no less beautiful, is the aptly named Cave Nebula (Sharpless 2-155). The subtle mixing of bright and dark nebula give this object its distinctive shape. Its size and dimness make it somewhat difficult to capture; as with other emission nebulae, a hydrogen-alpha filter will help to enhance its contrast.